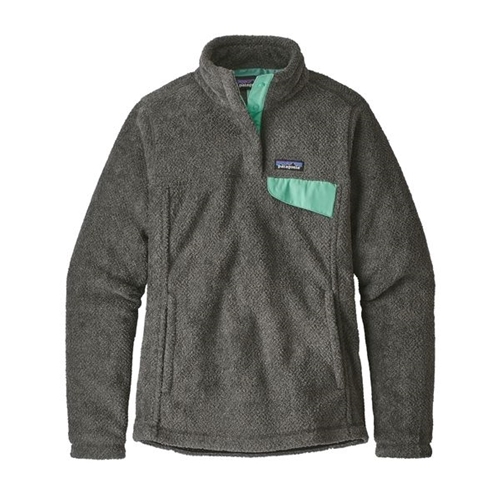 Made of Polartec Thermal Pro polyester fleece (51% recycled), this quintessential fleece pullover has feminine seaming and kangaroo handwarmer pockets. At any altitude, the weather-wise Re-Tool Snap-T Pullover is as essential to summer as a pocketknife and a corkscrew. The fleece pullover works well alone or layered, with lightweight, compressible deep-pile fleece (51% recycled) and extra-long fibers for warmth retention without bulk. The pullover is slim fitting, with feminine seaming and a hip length. Nylon reinforces the placket, which has four hidden snaps. Pockets include a nylon envelope-style chest pocket and a side-entry kangaroo handwarmer. The Re-tool is my favorite Patagonia piece I own! It is so soft and comfortable and really warm! on 1/4/2018 Warm and comfortable! I love these so much I decided to order all my friends one for Christmas. They are extremely soft, and keep you nice and warm.